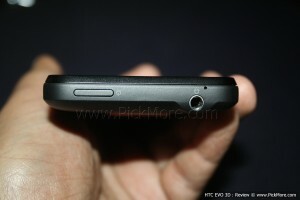 HTC has proved it with this new handset that they are not lacking behind from to-date technology. I would just say “let’s throw away the stereoscopic glasses” because the technology is changing. HTC EVO 3D and LG Optimus 3D are the two handsets which were invested wisely and changed the way a smartphone has to be. 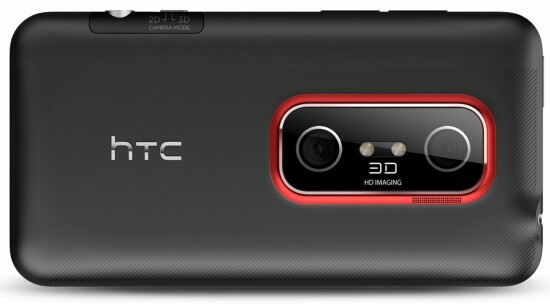 HTC has set up new dimensions in the mobile industry to build the 3D glasses free mobile phone handsets. [ad#ad-taalz-inpost-right]The outlook of the handset is pretty impressive. 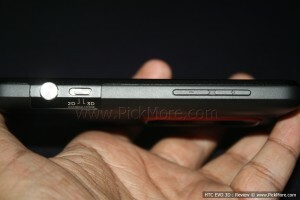 It is very easy to handle unlike the previous HTC Sensation which was kind of slippery through hands. Everything is easily accessible through thumb and the weight of the handset is evenly distributed. The black frame of the phone looks very impressive especially the back of the phone with dual camera and red outline give a very sober and impressive look. The front side of the phone has four quick navigation buttons to jump easily to the home screen, options, back and search. On the right side there is a sliding button for 2D and 3D shooting beside the huge round push button to take pictures. Headphone pin is on the top which makes it good for the users who usually put their phones in their upper shirt pocket. There were only two things which failed to impress me were the weight of the phone and the way to remove the back cover. It was very difficult to remove the back cover of the phone to insert the SIM card and the memory card. Yes, you have to remove the back cover of the phone to replace the memory card. The back cover looks solid but I think it will break from the side where there is the 2D/3D Switch after much usage. 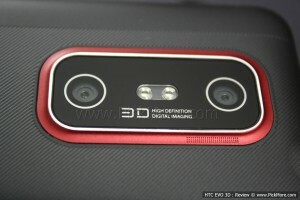 The screen of HTC EVO 3D is very impressive if I don’t compare it with the Super AMOLED screen. As far as I see it as a 3D screen or as Super LCD it is very good. The picture appears very bright but the black color is not that pure. The size of the screen is 4.3 inches and has 540×960 pixels dimension which makes it quite good to view videos on higher resolution. 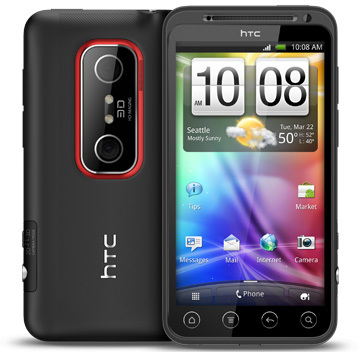 [ad#ad-taalz-inpost-left]1.2Ghz Dual-core processor with 1GB RAM is equipped in HTC EVO 3D. 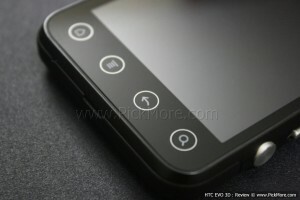 Beside that there is a separate graphic processing unit (GPU) which makes the HTC Sense 3.0 to work very smooth. The handset has 1GB of internal storage memory but can be expanded with MicroSD card of upto 32GB. The different benchmarks show very poor result of the performance of HTC EVO 3D, but way better than the performance of HTC Sensation especially the dual core processor performance has been improved a lot. I am going to love writing this part of my review. A super-duper 3D camera to take still photographs as well as video recording. The primary camera of the handset is 5 megapixels, 2560х1920 pixels resolution and has a dual flash light. Video recording is in good higher resolution of 720p @ 30fps. 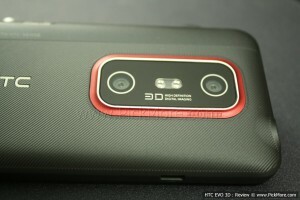 The dual lenses of the handset enable the user to take 3D photos and record 3D videos. The lenses do not focus properly on the macro shoot so there is a certain distance at which you can shoot photos and record video. The 3D video and photo is not in a very high resolution as compared to the 2D photo/video. There is a camera switch button on the side to switch between 2D and 3D shooting. Charging time appeared to be very poor to me while I was charging it from my laptop using the USB cable. It took more than 6 hours to charge 98% of the battery while with the regular charger the charging time is comparatively faster. With 30% of the battery remaining I hardly got 30 minutes of usage time with Wi-Fi for Facebooking, Tweeting and taking 5 to 10 still 3D photos. So it appears that the battery time is not very good, with full battery you will hardly get a 10 hours stand by time. [ad#ad-taalz-inpost-right]The overall usage of the handset was pretty good, and was easy to use. 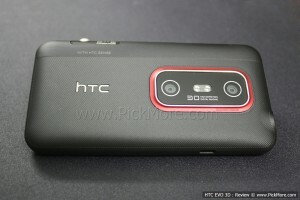 I liked the onscreen keyboard which was very good as compared to the HTC Sensation one. 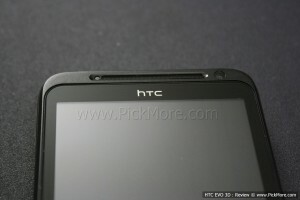 The menus and screen of HTC EVO 3D is very good for usage and if you have not tested out any other similar specs handset you will not find any flaw in it. The build quality of the set is absolutely beautiful and looks very solid. There are 3D games available like Need for Speed Shift 3D and Spiderman 3D which gave the real pleasure of 3D screen and I actually enjoyed playing. The 3D screen sometimes gives you a dizzy feeling but it is just because of the poorly shot picture or video. If the picture and video is shot properly at specific angle then you hardly get the dizzy feeling rather it appears everything is in front of you and your own finger and the objects on-screen merge together in front of your eyes. HTCSense.com is integrated in the handset to trace your handset location through the website and can be discovered if your handset is stolen or you have forgotten it somewhere. You can also lock your handset, forward calls or SMS to any other number and play up the ringer volume even if you have lost it somewhere in your home. The 7 home panes are highly customizable and provide very good widgets via HTC Hub.